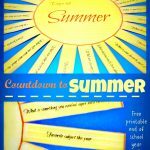 Are you excited for summer? There is so much about summer to love. The warm weather, time spent outside and family barbecues are just a few of the joys of summer. With all the extra time spent outdoors in the sunny summer weather, there are definitely some essential you’ll want to start your summer off right. Why not surprise your children with all the fun things they will want as they are out in the sun. It’s sure to be a fun and exciting way to kick off the summer! 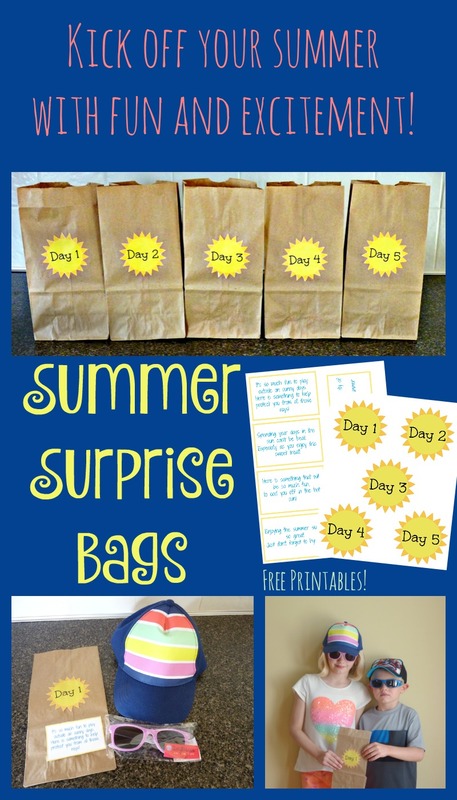 To create your summer surprise bags the first things you need to do is print off the free printable at the bottom of this post. For each day you will find a sun to go on the front of your bag and a poem to go inside with your surprise. 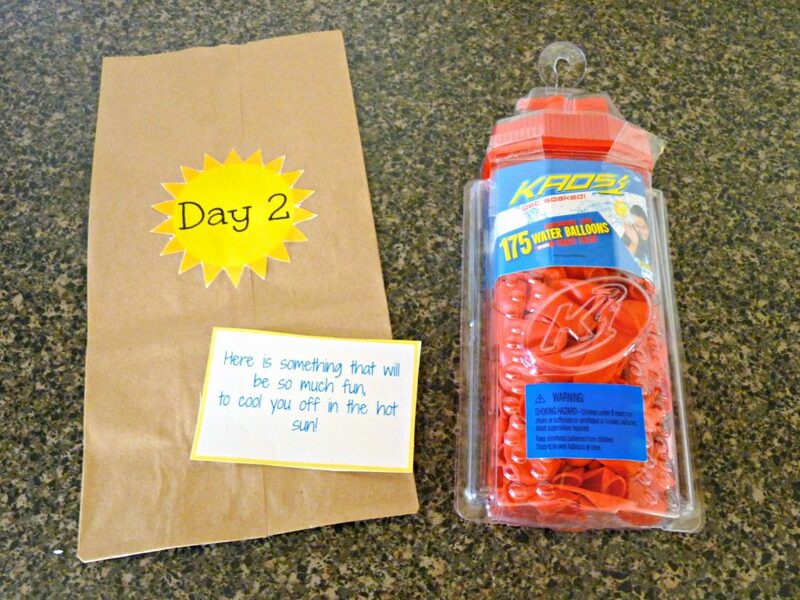 The first surprise is something that your child can use to protect their skin in the sun. 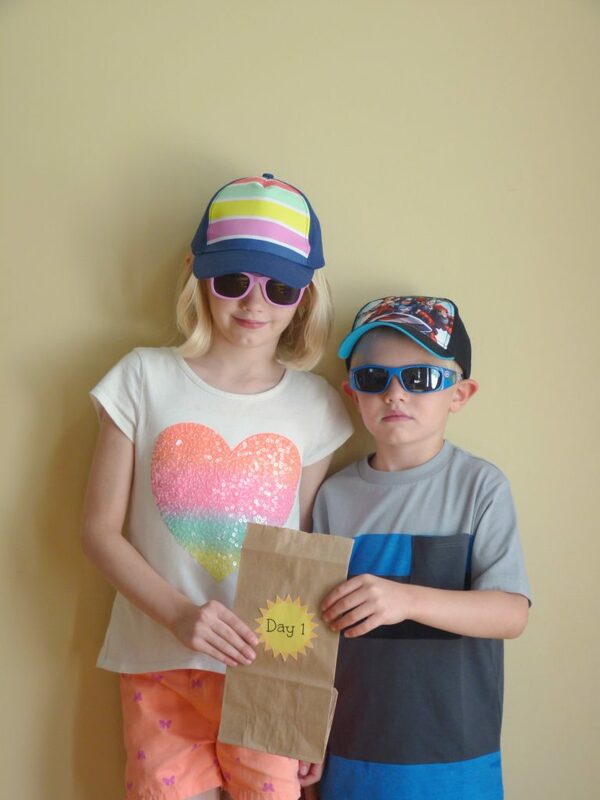 I choose to give my children new hats and sunglasses. A couple other ideas that could also work are sunscreen or a swim shirt. Day two your kids will be presented with something fun to cool them off in the sun. You could give water balloons like I choose to or any other fun water toy. 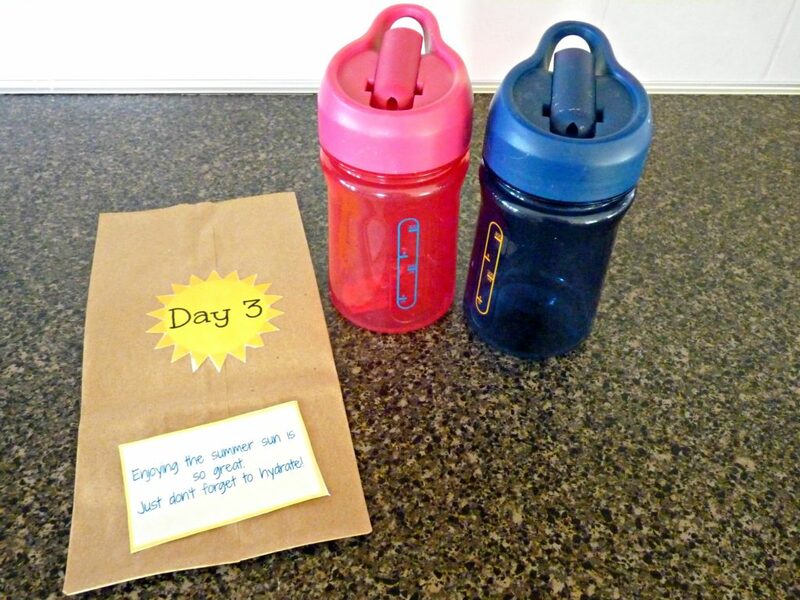 On day three your child will be given something to help them stay hydrated. My kids received water bottles that they can fill up and use throughout the summer. You could also give juice boxes, lemonade , or new cup. 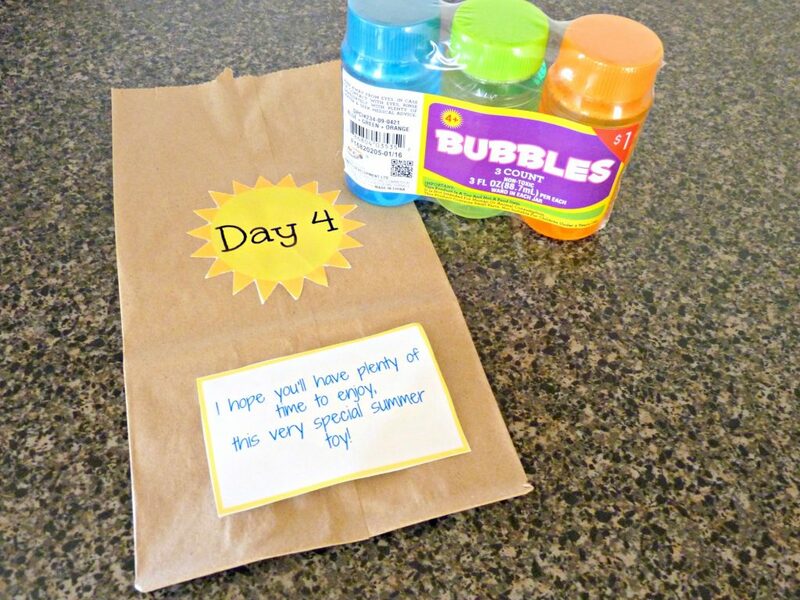 Your kids are sure to enjoy day four, which gives you the chance to give them any summer toy you choose. 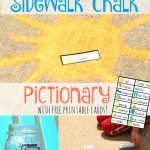 I think the classic summer toys are always fun like sidewalk chalk, bubbles, and sand buckets, but really the options are endless here. 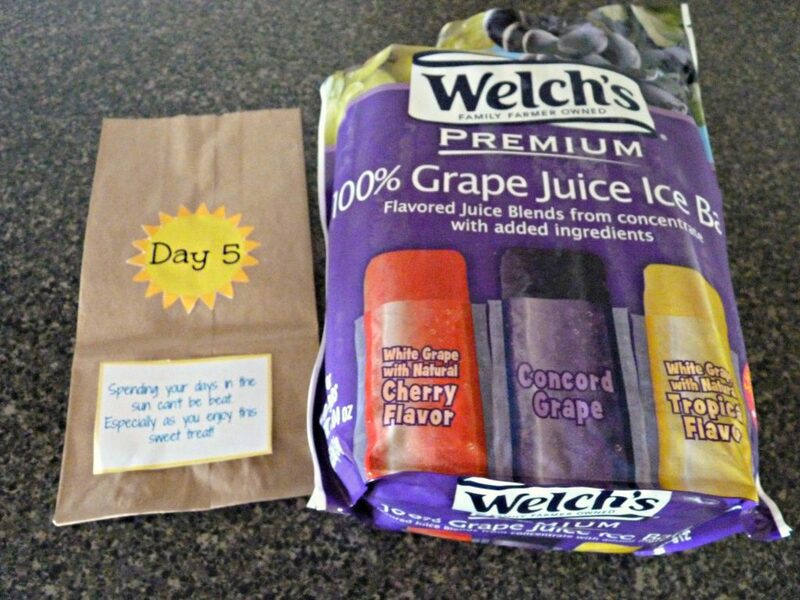 The last day they will be surprised with a summer treat. Popsicles are a treat that always reminds me of summer, so I choose to share them with my kids. Other fun ideas are popsicle molds, smoothie ingredients, ice cream, berries or melon. 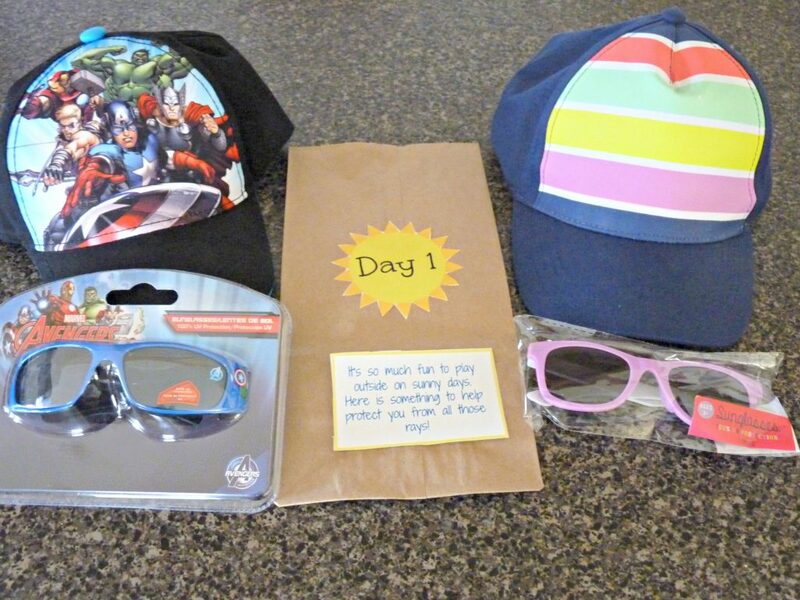 I hope your kids have as much fun as mine did opening up their summer surprise bags. 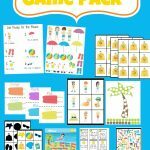 Feel free to download a free copy of the summer surprise bag printable below. Enjoy! 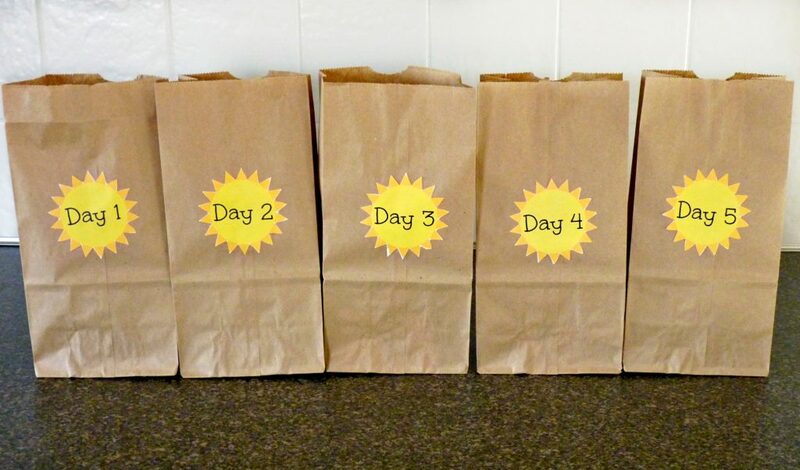 What fun surprises did you fill your bags with? I would love to hear. Please comment and share!